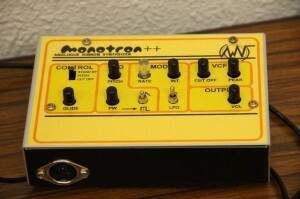 Monotron++ is based on korg’s monotron. I add it some more functions and make it as MIDI based synth. the all of original functions that comes with monotron are still alive except ribbon controller. I re-house it to more bigger enclosure but it still small and cute. there is some parameter that added to Monotron. Monotron++ has VCA that origial Monotron dosen’t have. It works as noise gate. So it may help you when you are recording its sounds. Glide is mostimportant parameter for analog synth, I think. there is no need this parameterm, when you paly it by ribbon. But you may want it when you drive it from MIDI. VCO Wave form selector Switch can change its VCO’s wave form. You can switch square wave and saw-tooth wave. Pulse width knowb can change its pulse width from 50% to almost 0%. It works only when you switch wave selector to square wave. EG/LFO switch can change LFO to EG. LFO is re-trigered by gate This switch allow you to use LFO as decay only EG. And there is output volume, MIDI input (DIN 5p) and recording output (mono 6.3mm jack)3.5mm jack output and AUX input still alive. but ribbon controller and speaker are removed. Just only MIDI input can drive Monotron++. It recognize over 24 as note number. Less than that should sound same tune as the lowest note.